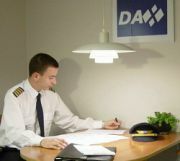 DAX is a Danish virtual airline operating over most of Europe and Greenland. We emphasize realism, social relations and exciting flight. We welcome you aboard and hope you will enjoy the ride in the front seat aboard our Dash 7 or one of our Boeing 737's. DAX - Diamond Air Xpress VA.
Is a Danish virtual airline, established in 2005. DAX operates with PC simulators Microsoft Flight Simulator 2004 / X and X-Plane 8 / 9 and 10. Our callsign in the sky is 'Diamond'. DAX is divided into thre divisions, DAXArctic (DAXAc) in form of our Arctic operations and bush flying. DAXCargo (DAXCa) that provide freight services all over the world. And finally our DAXEuropean (DAXEu) that flyes scheduled airline routes over Europe aswell as intercontinental. All our flights are made through our 'Crew Center' : FSAirlines.net (Refer to the menu 'Careers in DAX').